A group for women moving on from dysfunctional relationships. Developing skills and strategies to enable women to engage in healthy relationships. Join us our supporters, The Sisterhood Clontarf for lunch at Manly Skiff Club. All proceeds go to Community Northern Beaches . Guest Speaker Antoinette Colbran will talk about the importance of financial empowerment and awareness for women. We hope that this is the start of your amazing journey, that will not only improve your fitness and mental health but also make a huge impact on the lives of women in the community that you live in and also the community that we will explore. We’re looking for 10 women to join us in taking up the challenge to collectively raise $10,000 through sponsorship and a series of events culminating in the ultimate trekking adventure in Kakadu National Park. 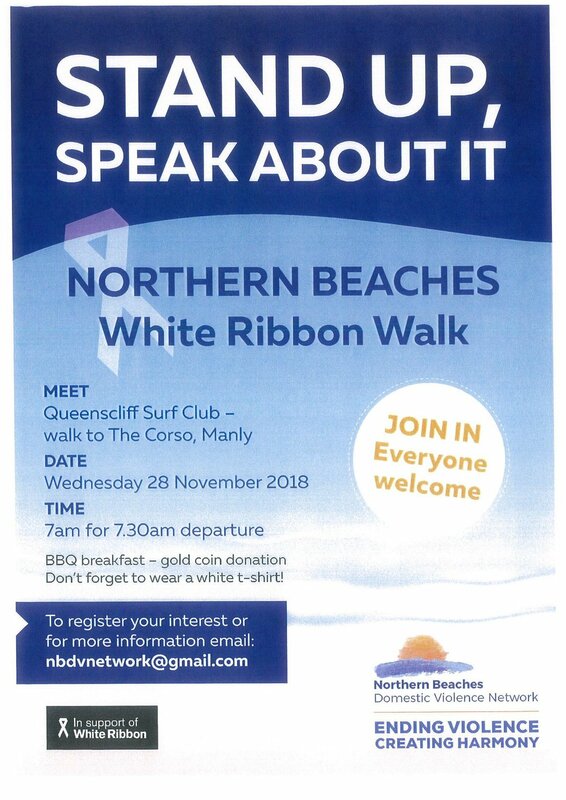 All money raised will go towards providing crisis support for women escaping domestic violence on the Northern Beaches and support a local women’s project in the Northern Territory. If you think 2019 is your year to do something amazing for your body and your soul with a group of like-minded women, then please read on! The money we raise will go towards women escaping domestic violence. By funding emergency accommodation and essential services and items, we will be supporting women at this critical stage of a process that is traumatic and stressful. An example of what $10,000 raised can provide is as follows: - 50 nights hotel accommodation whilst short-term/ refuge is arranged - Rental of storage facilities to keep woman’s belongings safe whilst a home is sought - Clothing and personal care packs for women who have had to leave urgently and empty handed - Food vouchers, for those that have had all access to money withheld by the perpetrator - Purchase of essential items to re-build a home including furniture and whitegoods. 2. You may choose to pay for the entire amount yourself and claim the charity donation component as a personal tax-deductible donation to your charity. 3. Lastly you can attempt to fundraise as much as you can in the given time and personally fund the balance of the total. Rest assured, once you have registered on this challenge you will receive full fundraising support from our highly experienced team through telephone calls, monthly meet-ups (if possible), a personal online fundraising page, a Facebook group where we post and share heaps of fundraising ideas and participation in organised fundraising events. This is a team effort all the way - you are not in this alone! Kakadu National Park is a World Heritage Area covering some 20,000 square kms. Waterfalls tumble from the red cliffs off the Arnhem Land escarpment into shady pools; tranquil wetlands teeming with animal and bird life, while 40,000 years of Aboriginal cultural heritage is on display in the numerous hidden rock art galleries. Get ready for a true Australian adventure! After all the fundraising and preparation, the wait is finally over! On arrival at Darwin you will make your way to the group hotel - The Cavenagh Hotel. Depending on when you arrive you may have time to explore Darwin or perhaps you’ll just want to relax by the hotel pool. We will gather in the hotel lobby at 4pm for a trek briefing with our guide before heading to a local restaurant for dinner. Leaving Darwin, we travel into Wulna Country and receive a Cul Cul or unique ‘Welcome to Country’ by the traditional owners of the land, the Limilngan –Wulna people. They’ll share with us their local Aboriginal culture with bush tucker talks, didgeridoo demonstrations, basket weaving and spear throwing. Next stop is the Mary River wetlands system, with the highest concentration of saltwater crocodiles in the southern hemisphere. Get close (but not too close) to ‘salties’ and other wild creatures on a unique billabong cruise. We arrive at Ubirr in time for sunset where you’ll see vivid Aboriginal rock art that dates back over 20,000 years. Then we head to our overnight camp in Jabiru, part of the Aurora Kakadu Lodge campgrounds. It’s an early start this morning as we take some 4WD action along a track to the awesome wonder that is Jim Jim Falls*. First we have a quick lunch break and take in the views of this 200m natural wonder before embarking on the challenging walk to the base where you can choose to swim or relax on the beautiful beach. This is really a site to admire and not rush so we spend the whole afternoon enjoying the scenery and waterholes before making our way back down to the 4WD truck for the short drive to our overnight bush camp. *If Jim Jim road is closed, an alternate itinerary will be provided, including waterfalls and alternate hikes. Unfortunately due to the unpredictability of the seasons, we cannot guarantee access to this road and it may be officially closed by the National Park. With more amazing waterfalls to experience we either head to Maguk and trek to the beautiful plunge pool for a dip to cool off, or hike to the top of Gunlom Falls for a swim and the breathtaking view of the escarpment country. We continue to enjoy the scenery as we make our way back to Darwin in time to have dinner and a well-earned drink at the magical Mindil Beach Sunset Market. Here we end our journey into the unique and unforgettable country of the Top End! Sydney This morning we farewell The Northern Territory, leaving only footprints and taking many happy memories. *You will be responsible for booking your own flights. We will recommend flights once registered. You will be travelling through Aboriginal land with a living culture and rich heritage. When on Aboriginal land it is necessary to accept that there may be some conditions of travel (your guide will explain) and that local and traditional obligations take precedence over permission to travel. Consider that Aboriginal land is essentially private land and that permission to enter is a privilege. Your guide will keep you informed of local culture, issues, and any considerations when meeting locals. Generally speaking, it is fine, rain-free and there is plenty of sun between May and October. The days are quite warm from May to November (tops of around 35°C) and evenings can be cooler (down to around 15°C). Mid dry season (Jun-July can be cold at night down to around 5°C in Katherine). As the wet season approaches (Oct/Nov) there are sometimes spectacular thunderstorms which provide relief from the humidity. Throughout the year we can swim in crystal clear, spring fed pools. What You Carry Our Kakadu Adventure is fully supported. You will need to carry just a day-pack with your water bottles, lunch (will be provided), sunscreen, hat, camera and other personal items. You should plan on carrying at least 3 litres of water each and every day. Equipment Required Once registered you will be sent a full packing checklist that will include options to hire certain items e.g. sleeping bags. Twin share room with ensuite at 3.5 star Cavenagh Hotel, breakfast in NOT included however the hotel is centrally located with a good choice of cafes close by. Twin-share permanent tents, with spring-mattress beds, and fly-screen covered windows to allow for breezes but no bugs. Shared facilities. Please bear in mind that because you will be traveling into a remote wilderness, creature comforts are limited. This trip is for almost anyone with a reasonable level of fitness and competent swimming ability. It is designed for the enthusiastic and adventurous in search of something different. Although graded at an introductory to moderate level, some days will be quite active involving steep walks for most of the day. We recommend you prepare for your adventure with some regular moderate exercise. Your level of fitness can also help you acclimatise to the warm temperatures and humidity. We will send you some training tips and also hope to organise some training walks in the Northern Beaches leading up to the trek where you’ll get the chance to meet some of the group and dust off your walking boots/shoes! If you have any dietary requirements please let us know in advance and we will do our best to accommodate them. About Us & Our Partners Goodwill Hunting Co. is a for-purpose business that provides strategic planning, program development and financial sustainability to charities and community groups. We are a team of five professional and passionate women with many years combined experience in the not-for-profit sector. Our clients include Gotcha4Life, The Burdekin Association, One Eighty, Lifeline Northern Beaches, Manly Warringah Football Association and The Layne Beachley Foundation. Join Daniel Peterson, Manager Homeless Services Community Northern Beaches, Justene Gordon and Digby Hughes on a panel facilitated by Candy Bingham at the next Voices of Warringah Event at Manly Life Saving Club. Are you intereste in Volunteering but don’t know where to start?! Join us and experience the outstanding benefits of Hatha Yoga which will calm, energise and balance your nervous system. A safe environment to nuture self while building strength and gaining greater clarity to feel renewed and empowered for the road ahead. The Clontarf Sisterhood invites you to Spring Lunch at Manly 16ft Skiff Club. Tickets are $85 each and include a 3 course meal and a welcome drink. Tickets can be purchased via Trybooking. All proceeds will be donated to Community Northern Beaches. You are invited to the ESL Volunteer Thank You Morning Tea!! Calling all current and interested ESL Volunteers, we would love to see you on Friday 28 September at Brookvale Community Centre!! The morning tea is a chance for ESL volunteers to meet one another, exchange ideas, discuss challenges and feel supported in their efforts. There will also be a short introduction to the programme for anyone would like to learn more about it. The Sisterhood is excited to welcome to its next event local author, TV news anchor and journalist Tracey Spicer . Tracey is renowned for the courage of her convictions, passion for social justice and her wicked sense of humour. Her recent best-selling memoir The Good Girl Stripped Bare is a candid insight into her upbringing and life as a female TV presenter. Through her experiences, Tracey will empower you to consider the barriers facing women, especially in the workplace, and inspire you to reassess the basis of your relationship with yourself and your family, friends and colleagues moving away from societal expectations to embrace new opportunities through authenticity. A popular 5 week program running every Tuesday from 8 May- 5 June 2018. • Parent confidence • Relaxation.